In my last post I talked about installing Rancid on Centos 7 so be sure to check that out. In this post we now want to actually use Rancid so I’ll walk through on how to setup Rancid to login into network equipment and get configurations. To recap: Rancid is a great tool to help monitor a device configuration for any changes. It also keeps track of them by using CVS (Concurrent Version System) for backups, so you can go back and compare versions or revert to a previous configuration. Rancid supports multiple hardware from Cisco, HP, Dell, Juniper and more. This is all open-source so you can create custom scripts or add commands to really make this a personal repository that fits your company. 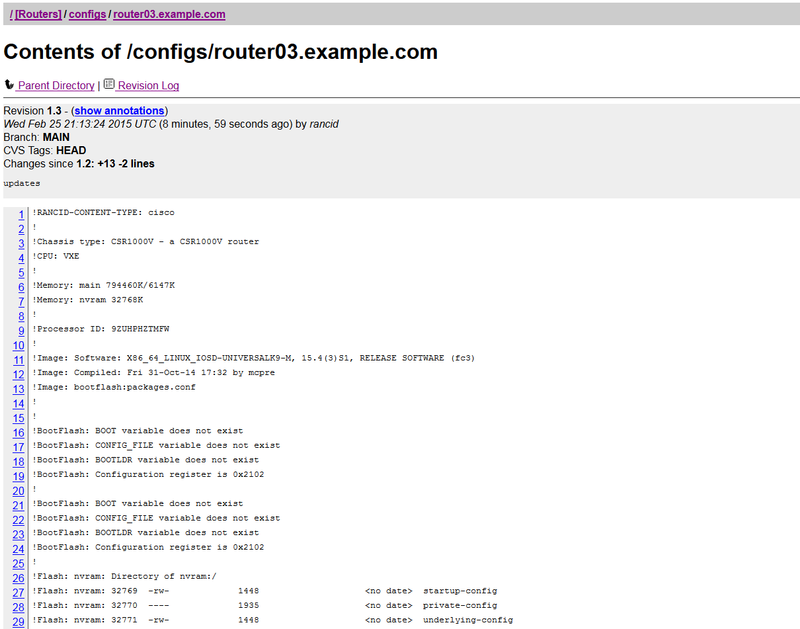 # This is an example of a router.db fle in Rancid. # Personally I think it looks better with DNS names. # You can also mark a device as down. This will cause Rancid to skip it. # Of course you can also comments throughout this file or alongside devices for notes. So we now have everything ready to test run rancid, we can test our luck by just running it once and to do that run the following command below. When the commands completes you should be able to browse via the webpage, see the devices you added with their configurations, and get an email if you’ve followed by earlier post. In this example log file everything went well, rancid is pretty good at telling you what the issue is if there is one. Once you capture devices you can view their configuration on the browser by going to http(s)://rancid-servicer-ip/viewvc. In this example I just have one device with two revisions on it, I’m using router03.example.com. What do you think? Screenshot of Rancid in ViewVC, using Router03 as an example. Diff between revisions on Router03. One of the last things to do is to setup a cron job to run rancid, it depends on your environment but in this example I’m running the rancid job every hour on the hour. I’m also clearing the log files every five days but running the job every day day at 11:50pm. Below is my example of the cron job. Make sure you in the rancid account (su – rancid) and then type crontab -e. Note you will be using vi so here is a crash course once you in the file type “i” for INSERT MODE type out the configuration once you are done type Escape key followed by “:wq” which will write (save) and quit the vi program. We now have a system that will log in and grab configurations of our network equipment on a scheduled basis. Rancid does way more than just Cisco devices although its in the name :). Rancid has made it pretty easy to even add you own custom scripts or add-on to what you want to see when rancid pulls a configuration so like before check out Shrubbery at http://www.shrubbery.net/rancid/ and the threads from Rancid Discussions at http://www.gossamer-threads.com/lists/rancid/ for details. I’ll stop it here I hope this information is helpful and as always let me know if you have any questions. Do you have an article listing the steps to setup ‘cisco-sb’ type devices to be congured with Rancid-3.1 or 3.2. I did every possible config/changes but could not get it to work. Finally had to downgrade rancid to 2.3.8 and then i was able for rancid to pull the config of cisco-sb devices. I can ssh to each device with the username I’ve made for RANCID from the server fine. Did you follow another post I did about Installing Rancid? Go over that and see if you are missing anything, you should see some cvs information and any errors/successes about devices in your router.db file. If you seeing blank logs it is likely rancid is not understanding the router.db file. #Personally I think it looks better with DNS names. #You can also mark a device as down. This will cause Rancid to skip it. #Of course you can also comments throughout this file or alongside devices for notes. Thanks for the response, I see what I did in the router.db file. I had an older version of RANCID running and in that the router.db file used colons instead of semi-colons. I had copied the old router.db file to the new server running current version and that’s why it didn’t read the routers or log into any of them. Thanks for your help and this great guide!! Hello. Thank you for this guide, it is really helpful. I followed your two guides but I have a problem when I run RANCID. When I run /usr/local/rancid/bin/rancid-run, it takes a few seconds, I have only one switch at the moment so I think it’s working. But when I go to viewvc, I just have rev. 1.1, with nothing in, and I don’t have a new one (like 1.2 …) when I run it again. I’m sorry, I don’t speak english very well, I hope you will understand ! Check the logs by going to nano /usr/local/rancid/var/logs/ and scroll through it and see what it says. You can also test logins by using clogin since you are using Cisco equipment. On CLI login into rancid, su - rancid then run this command to connect to one of your devices /usr/local/rancid/bin/clogin (IP address/Name of device) hit enter. If it all works you should be connected to your equipment, if not it should give you an error and from there you could troubleshoot more. When i use /usr/local/rancid/bin/clogin, I don’t have enough time to enter my password, and even if I’m fast enough and I enter the right password, I have an erroer : Authentication failed. I have probably made something wrong ! It’s maybe a problem with the switch? It works ! I’m connected to my switch, I have just an error for enable but it’s because I don’t give him the password. Check your /home/rancid/.cloginrc file. If clogin is not working than there is something wrong with your .cloginrc file. Comment out everything in that file and just start at the bottom of the file with you own configuration. I said in my last post that I need to use the command “_cmdline-mode” but I’m not sure that I have to use it to have access to the configuration of the switch. I know Rancid does support some HP hardware but I’m not entirely sure if your HP hardware is supported. In the router.db you put HP as the device instead of Cisco right? If that doesn’t work its probably something you would have to modify in rancid and that is something I’m not an expert in. You could check out http://www.gossamer-threads.com/lists/rancid/announce/ and post/search for your question over there. Thank you again for your answers and your tutorial !